Blended learning continues to grow as an approach to meeting learner needs, especially as schools put more computers and other devices into student hands. The growth of blended learning is generally paced at the comfort of teachers as they expand their use of digital tools for teaching and learning—at present learning to teach with digital tools seems to be the greater focus than exploring how to deepen students’ learning. Learning how to teach through blended learning makes perfect sense when the teacher is the learner, seeking to expand their toolbox of instructional practices. But opportunities exist to further transform practices by placing learning into students’ hands. Having visited many schools that incorporate blended learning, I’ve come up with four categories for the application of instructional technology. Viewing blended learning practices through the lens of these categories can show us how to deepen student learning. 1. Managed learning: Management of instruction and assessment is just as important online as it is in the physical classroom. 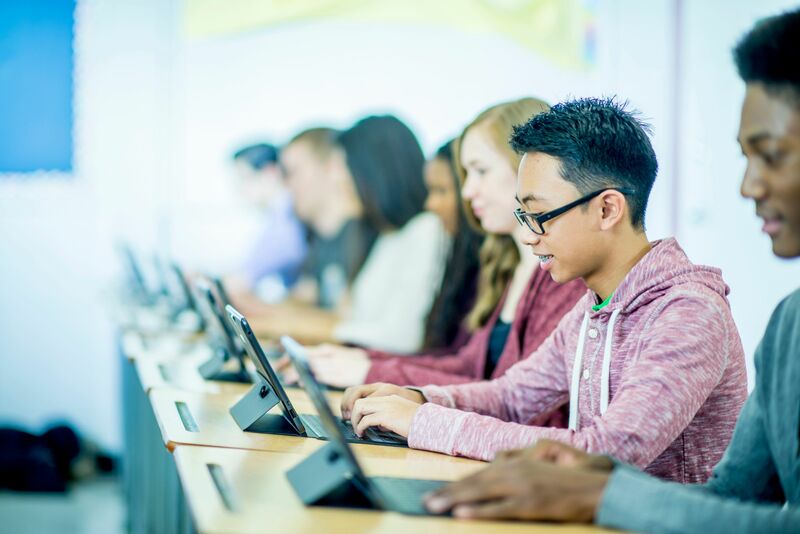 Online platforms such as Schoology, Google Classroom, and Blackboard CourseSites enable teachers to communicate about and collect assignments, give feedback, and offer learning resources to meet diverse learners’ needs. Teachers and administrators can communicate with students, parents, and other stakeholders in a rich dialog that places the learner at the center of the conversation. 2. Orchestrated learning: Teachers frame learning by directing students toward controlled experiences. Following the teacher’s lead, students participate in directed instruction and practice. Examples include completing digital worksheets, posting reading responses on discussion boards, taking notes from video tutorials or teacher-recorded lectures and demonstrations, or participating in whole class reviews using Kahoot or Edpuzzle. These first two categories of using technology for learning are a good foundation to build on. When adding the next two categories to the mix, teachers empower students to lead, which can bring deeper challenges—and deeper learning. 3. Collaborative learning: Student-led learning experiences—both individual and group activities—can promote collaboration and critical thinking. Teachers and students can work together to personalize learning based on students’ needs through an immense treasure trove of online resources. Use networking portals like LinkedIn and Twitter to connect with experts who can provide guidance and/or share their expertise with students. Using video conferencing, students can follow up with these experts, further linking curriculum to real-world interests. Sometimes students need personalized support. Teachers can keep this personalized support manageable in a couple of ways. After building a resource library based on common need areas, a teacher can expand it to address needs that come up less frequently, and advise individual students or groups about these helpful resources. In addition, try giving students voice as to how they demonstrate learning—for example, give them access to a list like my “100+ Tools for Differentiating Instruction Through Social Media,” and let them choose from that list or propose something else as a basis for creating a learning product. 4. Authentic learning: Learning should be made public. Students raise their game when they have to share their results with an interested outside audience—whether in live events or publications. Engage learning based on an authentic audience beyond the classroom to give a context for how curriculum applies to real-world situations. Use private sites like wikis, Schoology, and Google Hangouts so students can practice sharing work internally. Present student work on public sites, like blogs and social media platforms, when they’re ready to share their voice with the general community or a targeted audience. After networking via LinkedIn and/or Twitter, as described above, take those relationships to the next level. Provide students with “game day” moments, such as shark tanks, live-streamed presentations, or product presentations for a client. Students demonstrate what they know and can do for an audience that has an interest in the topic. Conduct feedback protocols and collaborative learning sessions with professional partners or clients. Video conference tools create access between any location or time. Real-time examples include WhatsApp, Google Hangouts, Skype, and Zoom. Asynchronous examples include discussion boards, tweets with hashtags, and the commenting feature on blogs, YouTube, and other social media platforms. Success requires a highly qualified teacher who uses their expertise and assessment tools to diagnose learner needs, and then crafts targeted instruction with the available resources. Only then can blended learning be transformational, when instruction is not a reflection of traditional practices and is instead a set of dynamic experiences in students’ hands.